Fred (fhahn [@] seriousstrength.com) has been involved in exercise ever since he became a member of The Charles Atlas Club when he was 10 years old. 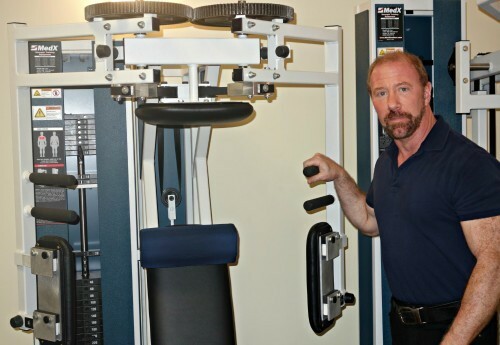 He began training clients in the early 1980s at several of NYC’s leading health clubs, including the Equinox and New York Health and Racquet Club. Fred is the owner of Serious Strength, a Slow Burn personal training and rehabilitative exercise center in NYC. Along with moms, dads, grandparents, and kids, his clients include top CEOs, celebrities, bestselling authors, journalists, and TV personalities. Fred, alongside Drs Michael and Mary Dan Eades, is the co-author of the New York Times best selling book The Slow Burn Fitness Revolution: The Slow Motion Exercise That Will Change Your Body in 30 Minutes a Week. It is currently in its ninth printing and is one of the best selling fitness books in Random House history. Fred’s latest book Strong Kids, Healthy Kids: The Revolutionary Program for Increasing Your Child’s Fitness in 30 Minutes a Week teaches parents and their children how to lift weights safely and eat healthfully by following a low sugar/paleo eating plan. Fred has appeared on NBC, CNN, WABC and he’s been interviewed by the New York Times and Washington Post. How an ectomorph can strength train for best results. The benefits of a high-fat diet for health, hypertrophy and productivity. How to motivate children to want to train every week. How to start a HIT business and charge premium fees. QUESTION(S) OF THE DAY: What questions do you have about high intensity strength training, business, or diet that we didn’t discuss in this podcast? Please let me know in the comments below. Hey guys. Thanks for the great discussion. Lots great stuff to think about, look into, and apply. You’re welcome Donnie. Any particularly poignant discussion points for you? The recommendations for starting an exercise gradually makes a lot of sense to me. Not exploding into the exercise/movement. The equipment that Fred has in his studios sounds very interesting. Not being able to move a heavy weight fast. The talk about micro loading makes a lot of sense. I wonder if this is not a very big key to the whole muscle building process. Fred talked about this before elsewhere, think about getting into some really small increments like 1/2 lb., 1/4 lb. The talk about diet/nutrition had my attention as well. I love food. Lot’s of high carb food. I have thought a lot about trying a diet along the lines of what Fred does. Who knows I might eventually. To me it kinda all comes back to quality, high intensity contractions in conjunction with having a somewhat heavy external load bearing down on or pulling on the body. Also for me I may somewhat limit the range of motion because I use free weights at home and some body weight stuff. I limit the range for safety and for more thorough loading.